1. the favorable or prosperous termination of attempts or endeavors; the accomplishment of one's goals. Success is measured differently by most people and being "successful" is also viewed differently from one person to the next. 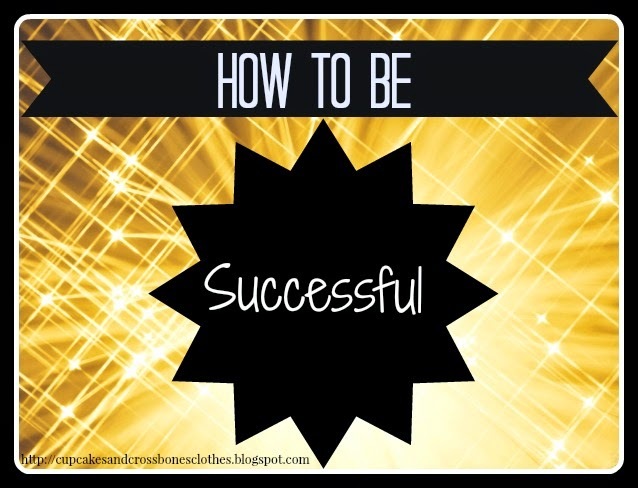 My idea of success may be completely different from yours and hey....that's ok! In order to become YOUR idea of successful though, you must clearly understand what your definition of success is. There are a few ways to do that, find out what success means to you, and achieve it. 1.) Define success in your own words. Write it down. Whether it is getting the job that you have always dreamt of to starting an organization raising money to rescue dogs. Whatever it is, write it down and focus on that goal. 2.) Do research. We are not perfect and we do not know everything. Take time to research ways to go about reaching your goal and research the goal itself to see if that is truly what you want. 3.) Long and short term goals. Whip out that note book and write down a list of short term goals. Short term goals are achievements that you want to accomplish in a small period of time that are going to lead you to your final goal of success. Examples of this could include the following. Say you want to get back into shape. Short term goals would consist of things such as cleaning out the pantry and refrigerator of unhealthy food, making an appointment to see a nutritionist, and signing up for a membership to your local gym. Long term goals on the other hand require time and planning. If we are following the previously listed example of getting in back into shape, some of your long term goals may include participating in tough mudder, loosing 10 lbs, and fitting into those jeans that just don't quite fit anymore. These are all considered long term goals because it takes more time to actually achieve them rather than short term goals which you could do that day or that week. 4.) Cross thing off your list. Is it just me or is it amazing the gratification that you get when you are able to cross things off a list? You are able to see your achievements progress and notice how close you are getting to your goal. By doing this, it will help you see how close you are to your success! 5.) Ask for help- It's ok to ask for help! It doesn't make you weak or any other silly thing you think it reflects. Many people got to where they wanted to be with the help of others. Believe it or not there are people out there who want to see you do big things and become successful, enjoy and embrace assistance. 6.) Remember- All things worth having you must work hard for. Success usually doesn't happen over night and if it did I guarantee you that you wouldn't be as grateful for it compared to if you worked hard at it. 7.) Lastly, do this with passion. If this success that you want to reach is your passion, never loose that. Passion is what drives you, motivates you, and keeps you moving forward when things aren't going quite the way you'd like it to. If this is a passion of yours you WILL accomplish your goals. You WILL be successful. What is your idea of success? What are your goals? I may have to follow this little list into the next year! I need to remember these things.. esp the ask for help one!! I am horrible at asking people for help until it turns into resentment and I just explode on people around me (bad trait I have) .. Thanks for sharing! I hear ya! Asking for help is something many people struggle with (especially if you are not used to it). We just need to remember that we are only human and we can only do so much. This was definitely something that I had to work on in the past and still work on to this day.